You can get married in the game if you would like to, though your spouse doesn't contribute anything to your farm. There are five marriage candidates per gender in the base game: Elise, Jeanne, Melanie, Nova, and Tabitha for boy farmers, and Cyril, Dean, Edmond, Gabriel, and Gareth for girl farmers. If you are playing the Nintendo Switch or Playstation 4 version of the game, Soleil can also become a marriage candidate for either boy farmers or girl farmers. Further, if you purchase the DLC expansions, Michelle and the Harvest Goddess become available for boy farmers, and Shirlock and Gorgan the Underworld King become available for girl farmers. To get married in the game, you've to raise your friendship with your chosen candidate, upgrade your house, obtain a Blue Feather, and then craft your wedding clothes. To start, you'll want to raise your music note relationship with the person who you want to marry. This can be done by giving gifts. Just open your bag to select the item you want to give, then select HOLD from the menu to place it in your hands for gifting to your sweetie. You can give one gift every day. As you raise your music note level, you'll trigger romance events with the marriage candidate. The romantic events trigger at 1 music note, 2 music notes, and 3 music notes. There's a bit of randomness though, so it isn't guaranteed to trigger exactly at the point you reach each note level. A week must pass since the last event before you can see the next event. You can see more than one candidate's romance event in a single day. At the fourth music note you can see a love confession event. You can see all of the confessions for all marriage candidates; viewing a confession doesn't lock you into marriage. Seeing this love confession will complete the friendship level requirement for marriage. The Blue Bird only appears on sunny evenings. After you have built the Giant House and wait a few days, you may dream of the Blue Bird appearing on the rock at the western beach area. When you awake, Rowan will tell you that tonight is a good chance to see if the Blue Bird appears. 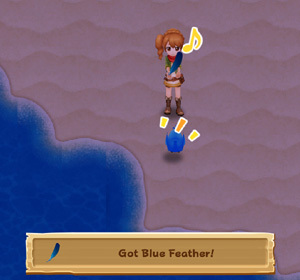 Walk into the western beach after 6:00 pm to receive a Blue Feather from the Blue Bird. It will automatically be added to the key items in your bag. After obtaining a Blue Feather, simply talk to the person you want to marry to trigger the "Do you want to propose?" dialog box. 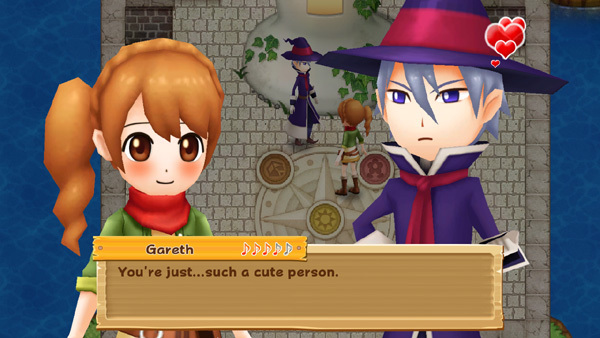 Reverse marriage proposals aren't in this version of Harvest Moon, so you've to ask for the person's hand in marriage. You'll go to the mountaintop for the romantic dialog and then travel to your fiances' family's house to announce the engagement. A date hasn't been set yet, but what are you to wear? Looks like you'll have to engage Melanie's fashion sense to obtain clothes for your wedding. Walk into Gus' blacksmith shop when Melanie is inside to see a cut scene where you ask her about some wedding clothes. The seamstress is more than willing to craft the wedding dress and tuxedo you'll wear during the ceremony. Gus volunteers to craft a new sewing kit for his granddaughter, but needs 3 Orichalcum ORE (not 3 processed Orichalcum) to complete it. You'll also be tasked with getting the items Melanie needs to craft your wedding outfits. She'll request 2 Great Cotton Candy Wool and 2 Great Silky Fur. Neither of these requests will be added to your Request List; you're just expected to remember it. Luckily talking to them again will remind you what you're assigned to collect. Orichalcum Ore can be found by jumping to floors 46, 51, 46, 71, or 76 in the mine. Just hit the ore nodes with your hammer to locate the requested ore. Collect 3 Orichalcum Ore and keep them in your bag, as you can't hand over the ore until you've both his requested ore and Melanie's wool. Cotton Candy Wool comes from Cotton Sheep and Silky Fur comes from Silky Donkeys. Melanie specifically wants Great-quality products and will NOT accept higher quality such as Supreme or Miracle. After you have the 3 Orichalcum Ore, 2 Great Cotton Candy Wool, and 2 Great Silky Fur in your bag, go back into Gus' shop when Melanie is inside. She'll thank you for the materials and tell you to return in 7 days. A week later, go back into the blacksmith shop, where Melanie will hand over the wedding attire she crafted for your ceremony. You then decide to have the wedding in another 7 days. 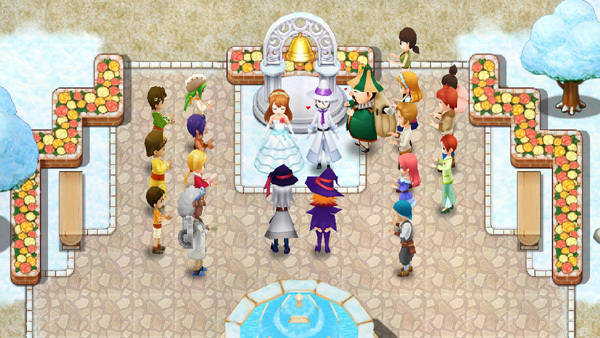 In the morning of the scheduled wedding date, you and your future spouse will dress in the proper attire and head to the Beacon Town square. Sam will proceed over the ceremony. After exchanging vows, and an only-heard kiss, the wedding will be over. Back at your farm house, your spouse will tell you their schedule and then you'll go to bed for the day. Your spouse will now live with you and be away from home based on their schedule. Because the wedding take the entire day, your crops and farm animals will not be cared for that day. You may find that some of your poor-health crops wilted.